$32,350 is what Kickstarter funded to finish and publish A Lifetime of Vermont People. Many others bought the book at a discount before it was published. This was almost two years ago. One of those years was a seven-day a week whack at photographing, writing, editing, researching and polishing. I put on weight, hurt my leg from being cramped with a computer for a partner, was stressed out…and obsessed with this book. I sat down to write 60 profiles of Vermonters. I became driven to finish the book, and do the best work of my life. Writing is difficult for me and it is as hard to write and polish 300 words, as it is 3,000. 2013 was putting the book together and having it printed in Italy. What marvelous printers they are, how awful they are at communication! So the book was late. I even drove to Bayonne NJ to pick up copies when we were late for an opening. You might have read of that trip on my blog! Finally, in late July 2013, I had a pig roast for the official opening—almost three months behind schedule. I spent the next two months fulfilling and supplying bookshops with Lifetime and mailed out those books I pre-sold at a discount. All of you—my extended family—helped create this book. Total cost for the book was $43,000 for 2,500 books. That sum was for printing, shipping, mailing, promotion, a short film, scanning, the design and marketing, office supplies. One part of the equation was not paid…ME! I lived on sales of photography and some writing. I increased the mortgage on my house by $30,000 to cover me during the two years spent full time on this project. It’s the only way to go. Bills and correspondence pile up. Projects are deferred. Relationships blow up. Luckily, smoking and drinking lay dormant. And the sale of the book kept the fisher cats at bay. I sold out the first printing. I gambled and ordered another 750 for $14,000 including shipping. All I would dare to order. I had saved $6,000 for reprinting and planned to borrow $8,000 from my life insurance. But the high cost of living in Vermont—gas, fuel oil, propane and let’s not forget taxes, put a big dent in those plans. I downsized my gallery to one room and will rent out the six small rooms I vacated. I’ll get by. At one point my $2,000 was all I had in my checking account. Gambling like this at the age of 80? But I will squeak through. Squeak through? An angel and a miracle! A friend who who helps his friends sent me a check large enough to pay for the 750 books. And a few other friends donated. I breathed easier, stress was in abeyance, at least for a little while. Was it worth it? Lifetime is a beautiful book, as many of you know. It is the most elegant black and white photography book I have created. In the last year Lifetime has won two gold medals as the best photo/art book from New England and it also was voted the best non-fiction book from New England by another book publisher association. Good for the book. I am proud of it particularly so for the writing which caused me such concentration and anguish. But it worked. The book takes top ranking as the coffee table book of choice in Vermont…Once you pick it up you’ll find yourself reading it from cover to cover, and going deep into the faces of 60 Vermonters I also photographed. I did my job to the best of my abilities. I did not know it at the time, but it appears that my book is a swan song to the end of a Vermont that was shaped by individuals working with their hands who were independent and self-employed. They never made much money, most of them. They had their communities, their neighbors, their animals, the superb flow of the valleys and mountains—the incredible beauty of an August day or the pure whiteness of a landscape layered under 12 inches of new snow, as seen from a hillside farmhouse, facing south south-west. There was this vibrancy we Vermonters shared with the purity infused in us from our mountains and valleys. That intangible soul of Vermont is waning. So I now have books to sell. Go to www.silverprintpress.com. You can read my blog but also order this black and white coffee table book, A Lifetime of Vermont People. Time for me to start on my next projects—two large size photo books, Paris in the 1950’s and Margaux Vendange 1957—the wine harvest in the most famous village creating Bordeaux wines. And no, I don’t have the funds to produce these new books so I’m out there again, creating magic on a wing and a prayer. Diane St. Clair produces hand-churned butter from her Jersey cows on The Animal Farm in Orwell and ships most of it to The French Laundry in Napa Valley, California, one of America’s elite restaurants. 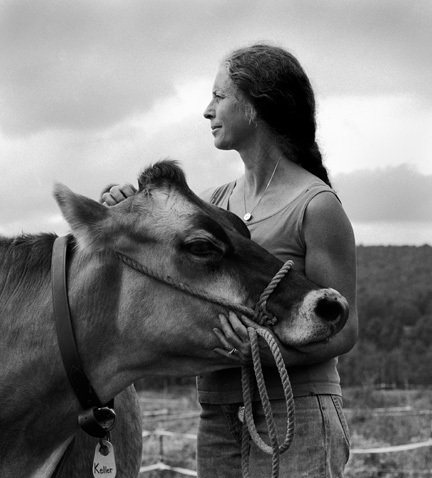 Diane is one of 60 Vermonters photographed and profiled in a Lifetime of Vermont People. Peter, I am happy for you. Must be gratifying to have such a large project behind you and be starting your new ones. And Spring is on the horizon! What Spring? Where is it? All I see is a deteriorating winter.